Have we arrived at the end of art for its own sake? In an age where higher education has never been more expensive, art school and other creative outlets now emphasize the vocational and the practical. Perhaps art for its own sake is no longer economically viable. It’s this question which seems to be at the core of Dan Richard’s latest book – part memoir, part polemic, part insight into the creative processes of a wide variety of artists, musicians, actors and more. The title comes from an ambitious project Richards undertook whilst studying at art school, constructing a fully functional airship that hung over the student union bar. In the course of the making of this project Richards’s becomes increasingly interested in the creative process and method of visionary artists of all stripes and with a rather straightforward approach goes off to ask them about it. It’s these interviews that form the majority of the book as alongside the engaging Richards we get to sit down with figures such as Dame Judi Dench, Manic Street Preachers, Jane Bown and Stewart Lee. What connects this wide range of figures is not any commonality of pursuit but rather a dedication to the idea of craft. Whether it be music, art, photography or comedy the practitioners listed all possess a distinct creative vision and an attitude that places their art first and allows for all other concerns to follow after. In an era of penny pinching that forces art to justify itself and expects economic outcomes for degrees in design it’s a deeply refreshing thing to see such a sustained defence of the centrality and primacy of creativity as an end, rather than a means towards a satisfactory economic outcome. The interviews then are not just hopeful, but defiant too – a much needed opportunity to see that vision need not be sacrificed to vocation and there is still a desperate need of crafts-people, artisans, visionaries and mavericks who are motivated by things other than their latest advance. 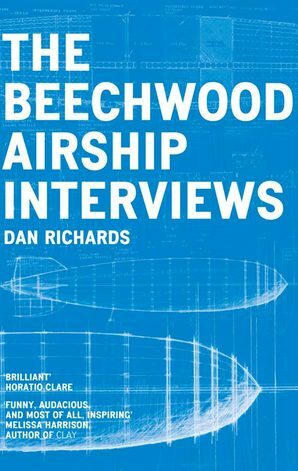 Richards’s himself seems to sit well in this category too – the book, like so much of the art he admires and much like the titular airship he made is delightfully well crafted. Large, reassuringly solid, it wears it construction lightly – Richards’s allows us to join him in the process of figuring out just what this project is. Through footnotes, digressions, time and location switches we get to join with Richards as he pieces together this remarkable collection of interviews trying to figure out what kind of art it is that he is creating. Idiosyncrasies are often mistaken for being frivolous but Richards and his quite remarkable book prove that underneath the levity, creativity is a deeply serious business, grappling with issues of meaning, of culture and of creation that affect us all.